The SDCBA encourages all members to volunteer their time either in pro bono legal services or general community volunteer opportunities. Join the many SDCBA members who give their time for a variety of community-oriented events and activities. Looking for a way to get involved but don’t know where to start? Review the SDCBA’s Guide to Giving Back. The SDCBA offers attorneys, paralegals, judges and law students opportunities to work in many environments, including with “at risk” children. To join the Community Service Committee, click here. 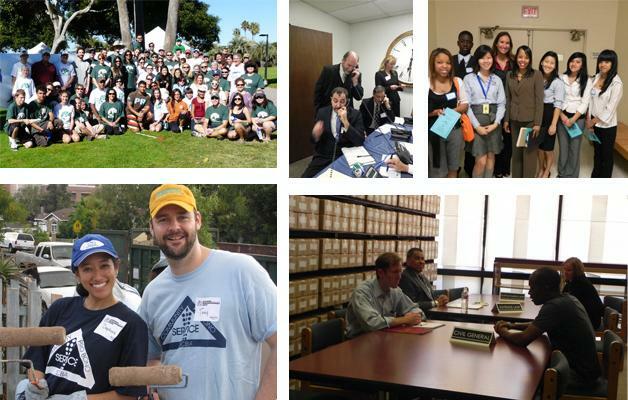 Check out the Volunteer Opportunities filter on our calendar to find the SDCBA's community service opportunities and events sponsored by other San Diego County bar associations and law-related organizations. The Fee Arbitration program offers parties an opportunity to resolve fee disputes as an alternative to taking the dispute to court. The San Diego County Bar Association is looking for attorneys and members of the public to volunteer to become arbitrators. To learn more about being an SDCBA Arbitrator click here. Join the SDCBA and the San Diego Superior Court in a joint service project by volunteering to serve lunch to senior citizens. In affiliation with the Wills for Heroes Foundation (WFHF), twice a year the SDCBA provides attorneys and legal professionals the opportunity to give back to those who risk their lives every day protecting and serving our community by preparing basic wills and estate documents for our local first responders. Volunteers can be experienced attorneys, paralegals, or new attorneys ready to learn and gain experience. To learn more about the WFHF, click here. Do you have a community service idea but aren't sure of the next steps? Most community service projects are reviewed and coordinated by the SDCBA's Community Service Committee. To review the SDCBA's Community Service Projects policy, click here. To apply for an appointment to a city, county or state committee, commission or entity, click here. To see all the Volunteer Opportunities and events in our community sponsored by the SDCBA, other San Diego County bar associations, and law-related organizations, go the SDCBA main calendar and look for Volunteer Opportunities or filter the calendar for Volunteer Opportunities. 1) Program is a sponsored program of an approved law-related organization or local bar association (click here for the list of approved groups); 2) Program has some link to the legal community i.e. a legal clinic or legal information sponsored by a local group or local group is looking for lawyers to assist in their effort; and 3) The opportunity is not political or religious in nature (i.e. not a rally or a program in support of a political or religious cause). Click here to submit a request to have a community service opportunity added to the calendar and to review the criteria for postings.